Amid Kremlin opposition, the UN General Assembly’s Third Committee approved a resolution condemning human rights violations in Crimea with the support of 67 member countries of the UN, 26 in opposition and 82 abstentions. The resolution condemned the illegal annexation of Crimea, the involvement in military operations and the illegal detainment of Ukrainians and activists, among other violations. The text of the resolution further calls for the release of those illegally detained and for the end of discrimination against those who stand against the occupation. Russia’s UN Ambassador has opposed the resolution and condemned the reference to the situation in Crimea as a “military conflict”, affirming both that Russia is not waging a war against Ukraine and that the choice to be a part of Russia was one made by the people of Crimea. The draft resolution will be reviewed in December 2018. 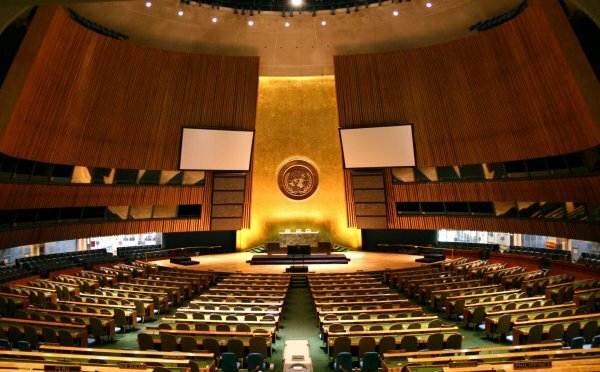 The third Committee of the General Assembly of the United Nations approved the updated draft resolution “Situation of human rights in the Autonomous Republic of Crimea and Sevastopol (Ukraine)”. The corresponding document was supported by 67 member countries of the UN, against 26, abstain – 82. The permanent mission of Ukraine to the UN said that the key elements of the draft resolution include a range of requirements of the Russian Federation as the aggressor state. The text States “the confirmation of the inadmissibility of acquisition of territory of Crimea by force and the obligation to return the occupied territories”. Also we are talking about the condemnation of the politically motivated persecution of Ukrainian citizens on the call for the release of all Ukrainians who are illegally detained in the occupied Crimea and in Russia. Illegally deprived of freedom the Ukrainian Director Oleg Sentsov, activist Vladimir Balkh and Crimean Tatar human rights activist Emir-Usein cook recognized political prisoners. However, there is a requirement of the international organizations and specialized UN agencies to indicate in the official documents of the Ukrainian Peninsula as “the Autonomous Republic of Crimea and Sevastopol city (Ukraine), which are temporarily occupied by the Russian Federation”. The document expresses the behalf of the UN Secretary-General to prepare a report on the implementation of this resolution and to develop recommendations for further action. After this consideration at the Committee meeting the draft resolution, the UN General Assembly final review in December of this year. Earlier, on 27 September during his speech at the General debate of the 73rd session of the UN General Assembly President Petro Poroshenko has called on Assembly members to support the new draft resolution on the occupied Russian Crimea to support Ukrainian political prisoners. In the draft resolution lists the names of all Ukrainian political prisoners. See also In the foreign Ministry told about attempts to prevent the consideration of the Ukrainian question at the UN General Assembly on 19 December 2017, the UN General Assembly approved an updated resolution on “the Situation of human rights in the Autonomous Republic of Crimea and Sevastopol (Ukraine)”. It was voted 70 countries. Against were 26 countries that abstained 76. The first time a resolution on the situation of human rights in the occupied Crimea, the General Assembly reviewed in December 2016. Then, too, it was supported by 70 countries, 77 countries abstained and 26 voted against. 27 Mar 2014 the UN General Assembly adopted the first resolution on the Ukrainian Crimea, which does not recognize the 16 March referendum in Crimea about secession from Ukraine and subsequent annexation of the Peninsula Russia. “For” the resolution voted by 100 member States, abstained – 58, while eleven voted against. The resolution, which is called “Territorial integrity of Ukraine,” noted in particular that the referendum in Crimea “has no force and cannot be the basis for changing the status of the Autonomous Republic of Crimea and city of Sevastopol”. Recall, October 30, 2018 during a meeting of the UN security Council, Deputy UN Secretary-General for political Affairs rosemary DiCarlo called on all parties in the Donbas to implement the Minsk agreement designed to resolve the situation peacefully in the Donbas. In particular, Deputy Secretary General of the UN said that despite all diplomatic efforts, the talks have achieved little progress at the cessation of hostilities in the Donbass. “The conflict in the East of Ukraine is now the fifth year is the active threat to international peace and security,” said DeCarlo. “At a time when the negotiations on the different levels continue seeking common ground, as before there is no effective embodiment of any of the agreements,” said DeCarlo. UN, November 16. /TASS/. The Third Committee of the UN General Assembly approved the Ukraine-led resolution which condemns alleged human rights violations in the region. This year, the Kiev-backed document was supported by 67 delegations. 26 voted against, including Russia, Belarus, China, India, Serbia and South Africa. 87 nations abstained. Russia’s deputy UN ambassador Gennady Kuzmin said ahead of the vote that the resolution’s authors were persistently trying to present the situation in Crimea as a military conflict, using the terms "annexation" and "occupation." "Judging by this choice of words, Ukraine has been waging an uncompromising war against Russia for four years. Too bad Russia did not show up to that war. No one in Russia is going to be at war with the brotherly people of Ukraine. Their attempts to punish the people of Crimea for its choice of Russia will fail," he said. "In strict compliance with the international law, the people of Crimea defended their right to live without Ukraine’s new national heroes - [Stepan] Bandera, [Roman] Shukhevich and other Nazi collaborators, they defended their right not to be buried alive under applause by national TV stations as was in Odessa in May 2, 2014, defended their right to be educated in their national language - be it Russian, Ukrainian or Crimean Tatar - and speak it freely," the Russian diplomat added.